The Treaty of Versailles had imposed severe restrictions upon Germany constructing vehicles for military purposes, and so throughout the 1920s and 1930s, German arms manufacturers and the Wehrmacht had begun secretly developing tanks. As these vehicles were produced in secret, their technical specifications and battlefield potentials were largely unknown to the European Allies until the war actually began. French and British Generals believed that a future war with Germany would be fought under very similar conditions as those of 1914–1918. Both invested in thickly armoured, heavily armed vehicles designed to cross shell-damaged ground and trenches under fire. At the same time the British also developed faster but lightly armoured Cruiser tanks to range behind the enemy lines. Only a handful of French tanks had radios, and these often broke as the tank lurched over uneven ground. German tanks were, on the contrary, all equipped with radios, allowing them to communicate with one another throughout battles, whilst French tank commanders could rarely contact other vehicles. The Matilda Mk I tanks of the British Army were also designed for infantry support and were protected by thick armour. This was ideal for trench warfare,[dubious – discuss] but made the tanks painfully slow in open battles. Their light cannons[dubious – discuss] and machine-guns were usually unable to inflict serious damage on German vehicles. The exposed caterpillar tracks were easily broken by gunfire, and the Matilda tanks had a tendency to incinerate their crews if hit, as the petrol tanks were located on the top of the hull. By contrast the Infantry tank Matilda II fielded in lesser numbers was largely invulnerable to German gunfire and its gun was able to punch through the German tanks. However French and British tanks were at a disadvantage compared to the air supported German armoured assaults, and a lack of armoured support contributed significantly to the rapid Allied collapse in 1940. The Kriegsmarine introduced the pocket battleship to get around constraints imposed by the Treaty of Versailles. Innovations included the use of diesel engines, and welded rather than riveted hulls. Specialised bombs: cluster bombs, blockbuster bombs, Bouncing bombs, and bunker busters. The massive research and development demands of the war included the Manhattan Project, the effort to quickly develop an atomic bomb, or nuclear fission warhead. It was perhaps the most profound military development of the war, and had a great impact on the scientific community, among other things creating a network of national laboratories in the United States. The British however started their own nuclear weapons program in 1940, being the first country to do so. However, due the potential radioactive fallout, the British considered the idea morally unacceptable and put it on hold. In 1947 the project was restarted and the first successful nuclear weapons test carried out on 3 October 1952 in Operation Hurricane and came info full service by 1955. Britain was also the first to come up with the idea of nuclear energy and hint at a potential for atomic weapons in 1933. It was patented in 1934, (British patent 630,726), which help to lead the way into the further research and later, the successful development of nuclear weapons. The invention of the atomic bomb meant that a single aircraft could carry a weapon so powerful it could burn down entire cities, making conventional warfare against a nation with an arsenal of them suicidal. Following the conclusion of the European Theater in May 1945, two atomic bombs were then employed against the Empire of Japan in August, hastening the end of the war, which averted the need for invading mainland Japan. The strategic importance of the bomb, and its even more powerful fusion-based successors, did not become fully apparent until the United States lost its monopoly on the weapon in the post-war era. The Soviet Union developed and tested their first fire weapon in 1949, based partially on information obtained from Soviet espionage in the United States. Competition between the two superpowers played a large part in the development of the Cold War. The strategic implications of such a massively destructive weapon still reverberate in the 21st century. There was also a German nuclear energy project, including talk of an atomic weapon. This failed for a variety of reasons, most notably German Antisemitism. Half of continental theoretical physicists—including Einstein, Bohr, Enrico Fermi, and Oppenheimer—who did much of their early study and research in Germany, were either Jewish or, in the case of Enrico Fermi, married to a Jew. Erwin Schrödinger had also left Germany for political reasons. When they left Germany, the only leading nuclear physicist left in Germany was Heisenberg, who apparently dragged his feet on the project, or at best lacked the high morale that characterized the Los Alamos work. He made some faulty calculations suggesting that the Germans would need significantly more heavy water than was necessary. Otto Hahn, the physical chemist who had the central part in the original discovery of fission, was another key figure in the project. The project was doomed due to insufficient resources, time, and a lack of Governmental interest. Electronics rose to prominence quickly in World War II. 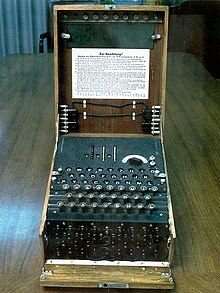 The British developed and progressed electronic computers which were primarily used for breaking the “Enigma” codes, which were Nazi secret codes. These codes for radio messages were indecipherable to the Allies. However, the meticulous work of code breakers based at Britain’s Bletchley Park cracked the secrets of German wartime communication, and played a crucial role in the final defeat of Germany. Americans also used electronic computers for equations, such as battlefield equations, ballistics, and more. Numerous small digital computers were also used. From calculating tables, to mechanical trajectory calculators, to some of the most advanced electronic computers. Soldiers would usually carry most of the electronic devices in their pockets, but since technology has developed, digital computers started to increase in size, which spacious command and control centres would have. Initial control centers that were embarked on ships and aircraft that established the networked computing, is so essential to our daily lives. While prior to the war few electronic devices were seen as important pieces of equipment, by the middle of the war instruments such as the British invented radar and ASDIC (sonar) had become invaluable. Germany started the war ahead in some aspects of radar, but lost ground to research and development of the cavity magnetron in Britain and to later work at the "Radiation Laboratory" of the Massachusetts Institute of Technology. Half of the German theoretical physicists were Jewish and had emigrated or otherwise been lost to Germany long before WW II started. During 1932, the creator of M&M's, Forrest Mars Sr. moved to England, and began manufacturing Mars Bars for troops in the UK. During the Spanish Civil War, Forrest purportedly encountered troops eating small beads of chocolate that were encased in hard sugar shells. Upon returning to the US, he approached Bernie Murrie, the son of a Hershey's executive, to join him in his business venture as he anticipated a demand for chocolate and sugar during the war. After the design had been patented in 1941, a plant located in Newark, New Jersey, began production of M&Ms that year. The candies were sold exclusively to the military when the US joined the war and were used as an easy way to provide the troops with chocolate on the battlefield without it melting so easily. After the war, in 1946, the candies again became available for the civilian population. ^ Roberts, Susan A.; Calvin A. Roberts (2006). New Mexico. University of New Mexico Press. ISBN 9780826340030. ^ Dominic Selwood (29 January 2014). "The man who invented poison gas". The Telegraph. Retrieved 29 January 2014. ^ "Jet Fighters: Inside & Out", Jim Winchester, 2012. ^ "Meteor I vs V1 Flying Bomb", Nijboer, Donald. ^ Parshall and Tully, Shattered Sword: The Untold Story of the Battle of Midway. p. 336. ^ "Inventor of the Week: Archive". Web.mit.edu. 2005. Archived from the original on 10 March 2005. Retrieved 18 July 2016.